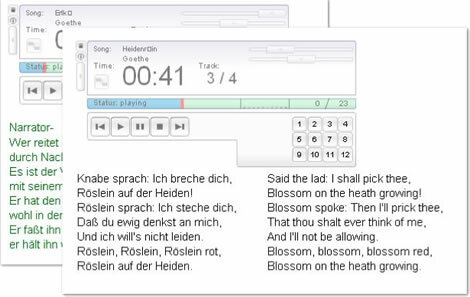 The Lyric Translator brings context to some German and Italian operas by providing an English translation. This learning object is in the form of a modern-day jukebox. The original object (an open source MP3 player developed by, Matthias & Caroline Kannengiesser allows mp3 files to be streamed rather than downloaded) was modified by us to accept timing and language data. Students select the particular track and as the lyrics of the song begin they are displayed in the original language as well as English. The on screen text is displayed in the same fashion as a movie subtitle. To use, select a track (1 – 4 only), then press play. This entry was posted in Interactive, learning activity, Music and tagged fine arts, flash, Music, opera, translator by Britt Carr. Bookmark the permalink.